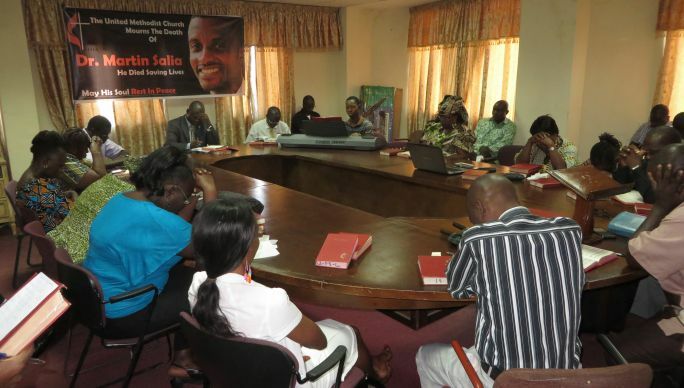 Staff members of the Sierra Leone Conference pray for Dr. Martin Salia during devotions on Nov. 19, 2014, in Freetown. Salia died of Ebola on Nov. 17, 2104. 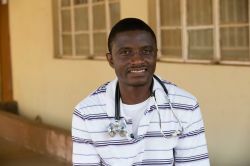 The death of Dr. Martin Salia — the United Methodist Kissy Hospital surgeon who died of Ebola after he was airlifted to the U.S. for treatment—was mourned as an “irreparable loss” by colleagues, church officials, family members, and government officials. “Sierra Leone has lost a hero, it has lost an asset. This is an irreparable loss,” Dr. M’Baimba Baryoh, a former tutor and colleague of Salia, said in a tribute at the memorial and thanksgiving service at Brown Memorial United Methodist Church. The church is on the grounds of the hospital where the 44-year-old was the medical director and the only surgeon. Many hospital staff who attended the service on Dec. 2 had just left the 21-day mandatory quarantine period for possible Ebola exposure after Salia tested positive for the deadly virus. Hospital staff crowded the pews wearing T-shirts bearing the photo of the late surgeon and wept bitterly during service. No staff members have shown any symptoms of Ebola. Salia died Nov. 17 at Nebraska Medical Center in Omaha after being airlifted from an Ebola treatment center in Sierra Leone. More than 6,000 people have died from Ebola in West Africa. Yambasu said Salia began part-time at Kissy in 2011, proving himself a committed, dedicated professional surgeon who was more interested in the health of his patients than in the money he received from them. Later, he was hired as a full-time surgeon and chief medical officer for Kissy Hospital. The bishop referred to Salia’s interview earlier this year with United Methodist Communications, in which the doctor spoke of his belief that God had sent him to work in Sierra Leone. The Great Plains and Baltimore-Washington Conferences of The United Methodist Church are collecting funds to help Dr. Martin Salia’s family pay medical and transportation expenses. Donate online to the Great Plains fund. He paused for the video to be played, and some hospital staff burst into tears as they heard Salia speak. Others spoke of Salia’s passion and dedication to his work. “Dr. Salia was very passionate about his job. He loved people, always smiled, was conscientious, meticulous, very intelligent and gave confidence to his colleagues. He did not leave anything to chance; he prepared,” said Yeabu Kamara, an administrative overseer in the Kissy Hospital’s restructuring program. Leonard Ben Gbloh, the acting hospital administrator, said the staff remains in a state of shock. “He (Salia) outlined a series of innovative plans for the hospital. It is sad that those plans have been left on paper,” Gbloh said. The staff sang a dirge titled “Oh, happy days when Dr. Martin Salia was with us,” as one person solemnly read out what the late surgeon meant to them. The reader spoke of how Salia was determined to move the hospital to a first-class hospital in Sierra Leone and how he sacrificed so that others could live. Dr. Martin Salia in April 2014 at United Methodist Kissy Hospital before his death from Ebola on Nov. 17, 2014. Photo by Mike DuBose, UMNS. Baryoh spoke of how he had watched the young man go from academic excellence to a successful surgeon specialist. Salia graduated with the second highest grade in surgery. “Dr. Salia was always ready to help and used his youthfulness to move around Freetown anytime he was needed. He was full of energy,” Baryoh said. Salia joined the staff of his alma mater, the College of Medicine And Allied Health Services, as a lecturer in surgery and anatomy in 2012. Baryoh was principal at the college. Salia was one of the few lecturers who taught in three faculties of the college – Faculty of Basic Medical Sciences, Clinical Sciences and the Faculty of Nursing, Baryoh recalled. He said the student population was full of grief upon hearing about Salia’s death. The memorial service was the second held in Freetown this week. The first was organized by Salia’s family at St. Martin’s Catholic Church on Sunday, Nov. 30. The Centers for Disease Control is providing training for the Kissy Hospital staff as they prepare to resume normal work next week. *Jusu is director of communications for The United Methodist Church in Sierra Leone.